When talking about digital marketing with chiropractors, one of the primary questions is “does SEO work for chiropractors?” I decided to put together a quick video outlining what an effective search engine optimization campaign looks like for a chiropractor when it’s done properly. Hello, it’s Jeremy Litwicki from Profit Addiction, and what I want to go through in this video with you is to show you some of the results from one of our chiropractic client campaigns we are working on. 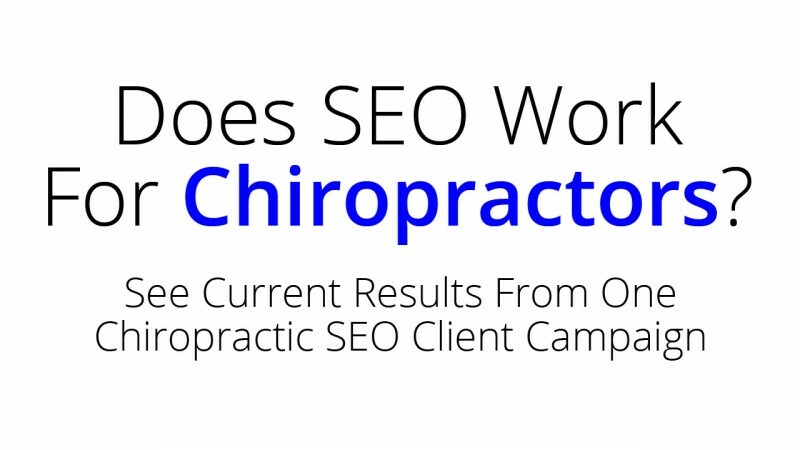 It will help to cover the question that a lot of chiropractors ask me which is “does SEO (search engine optimization) work for chiropractors?”. Search engine optimization is the ability to get your website shown at the top of search engines for various keywords and phrases. So, the first thing to go through here just are a handful of screenshots from specific rankings from one campaign we’re working on with a specific chiropractor, and these black bars here are to protect their privacy for the specific area they’re working in. You can see here when we started working on the campaign, there is a lot of up-and-down movement as we’re doing work. Google sees the work that’s getting done and can see what’s going on and it takes time for all that stuff to solidify as you see here. Back in mid-August, we were somewhere in the middle of the first page. 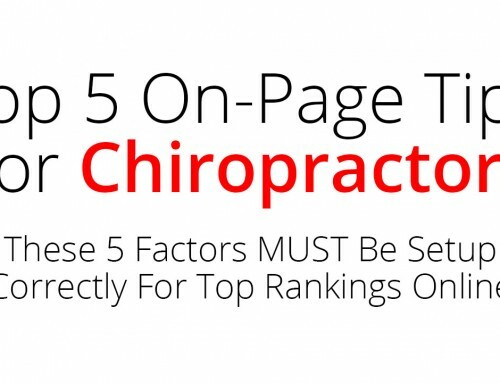 Start doing work and things are bouncing around quite a bit, takes until October for this specific keyword for this specific chiropractor we are working with and now we are solid at number one. Another result here, very similarly and much less bouncing going on, but same type of bouncing you can see which is from about mid page one here and bouncing up and down a little bit and then solidified here at the top of page one for another keyword and phrase. Some of these keywords and phrases include city plus chiropractor, chiropractic, some include city plus the state abbreviation, some include the word “in” so “chiropractor in city” and then some of these are the differences between desktop searches and mobile searches. There are essentially two separate search engines that Google looks at and we track rankings in all of those. Here’s another keyword. Same process here middle of page one when we started, solid at number one for the past month here. Another keyword, again as we started working things are bouncing up and down a little bit, get up at spot number one, bouncing down a little bit, and then continue working to make sure things are done correctly. Solid at number one, and this is for the “chiropractor in city” keyword for him. Here is one of the more crazy-looking keyword tracks you can see here and this is, there’s a lot of bouncing going on here and this is for a city chiropractor phrase, and again started working we’re at the bottom of page one there are 10 spots on page one and you can see here this is rank one rank ten rank a hundred, so this is not to scale. And basically a lot of bouncing going on here a lot of bouncing still, and took a little while but we are pretty solid on the top of page one still some work to do to make sure that this continues on obviously, but bouncing around a little bit still. And again this is all completely normal for all this type of stuff to happen, another phrase here same thing middle of page one bouncing around a little bit, solid at result number one, and then a couple more here to show you, the same thing as we’ve been seeing and this one actually has actually been solid at number one now for almost two months, which is really awesome to see and clients love to see that as well, and then the last one here for city chiropractic keyword is middle of page one bouncing around a little bit solid at result number one, so what this looks like from an overall view for the campaign this is quick stat here we’re basically tracking 30 keywords and phrases for this client, and that includes the desktop and mobile, so for example if you had the search for chiropractor in the city that would be one search on desktop and one search on mobile which would be technically two terms tract here that’s what that means. And then these rankings over the last 24 hours last week last month not critical here just shows us what’s going on in the click to view, the biggest thing is the current ranks right now for this client of the keywords we are tracking, number one result for twenty keywords number or top 10 for five keywords and that does not include these number one results, top twenty for two other keywords, so a lot of awesome results here for this client, and one of the reasons and ways were able to do this is because we understand what it takes to rank online, and we do the exact same thing for our website, we do the exact same thing for our clients and other test sites as well, and one of the things I like to show a chiropractor specifically is if you go to google and type in chiropractor SEO expert, there are about 212,000 competing results, and after you look at these ads here, these are all people who are all paying every time someone clicks on their site, we are number one out of over about 212,000 results. And then similarly for the phrase best chiropractic marketing expert there are about 465,000 competing results here, same thing there’s four ads here of people who are paying to be shown there, we are number one here as well, so basically when it’s done correctly it takes time to make sure that everything is done properly, but when it is done correctly it is long term and it does work very well when someone who knows what they’re doing is working on your website and your SEO. Hope this was helpful and was able to shed a little bit of light to you about SEO, its effectiveness, and a little bit of an inside view of some of the bouncing that goes on as you start working on a campaign with keyword rankings. Again, I hope this helpful, hope you have a great day, and if you have any questions about it, please let me know. Thanks! Learn more about our chiropractic search engine optimization process.